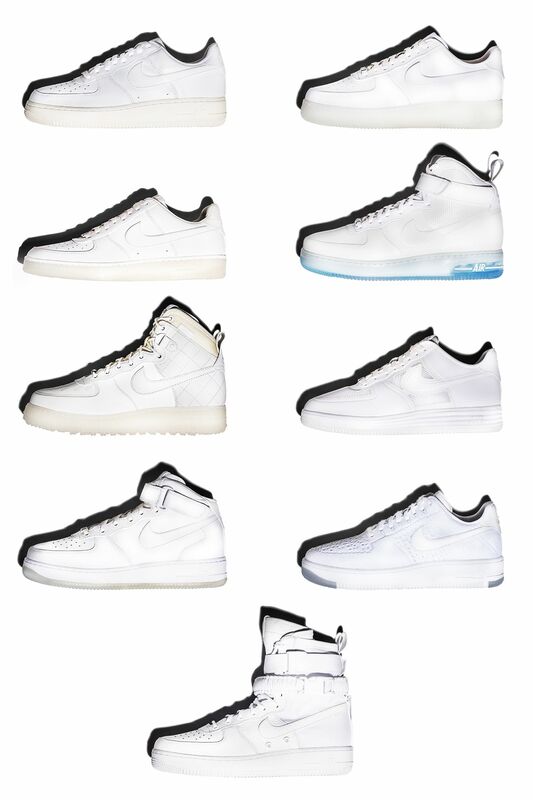 Since its inception, the Air Force 1 has been released in countless colourways, providing seemingly unending iterations every year. Traditionally worn for its bold expression, the most iconic iteration actually sports no colour at all; the White on White. 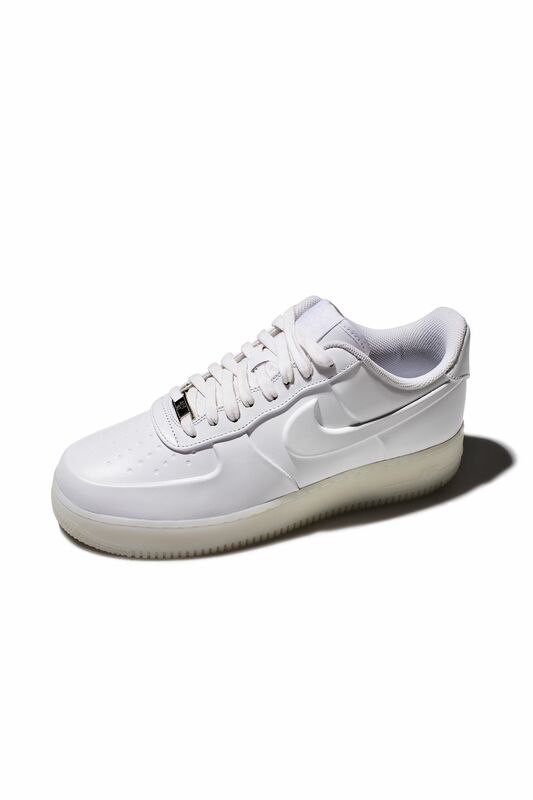 Over the years, the simple and versatile White on White proved to be the perfect canvas to bring Nike's latest innovations to life. From Foamposite to Lunar and now, a rugged utilitarian edition inspired by the Nike SFB Boot—each version tells a different story of innovation through its timeless design. 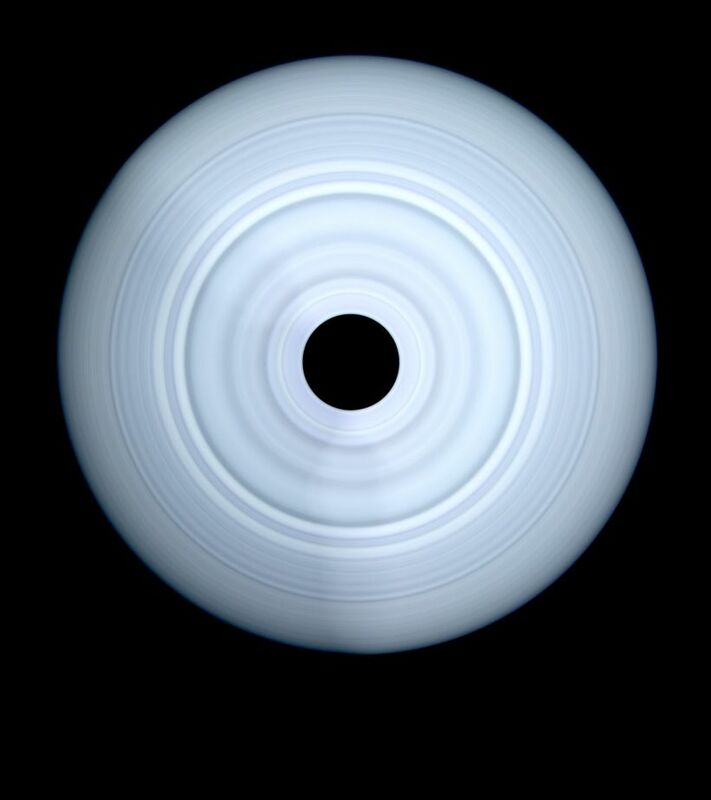 The most recognisable take on the White on White is as simple as it gets. Classic leather builds over a traditional Air Force 1 sole. Over the years, we've seen several iterations from high to low, tumbled leather to smooth and perforated leather. It's the one that started it all and paved the way for a generation. 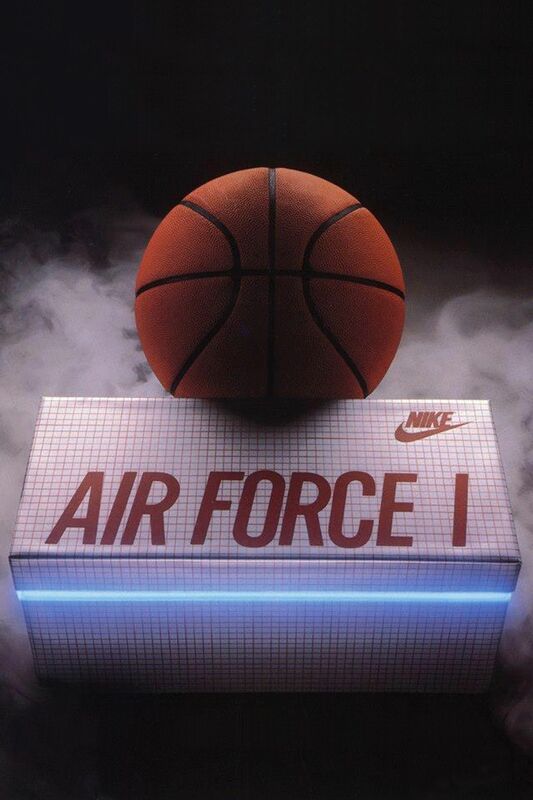 As the first Nike Basketball silhouette to utilise Nike Air, it set the standard for decades of AF1 innovation. At first glance, the Vactec Air Force 1 appears to have a traditional construction. While classic in appearance, the design is actually built with a one-piece leather upper. 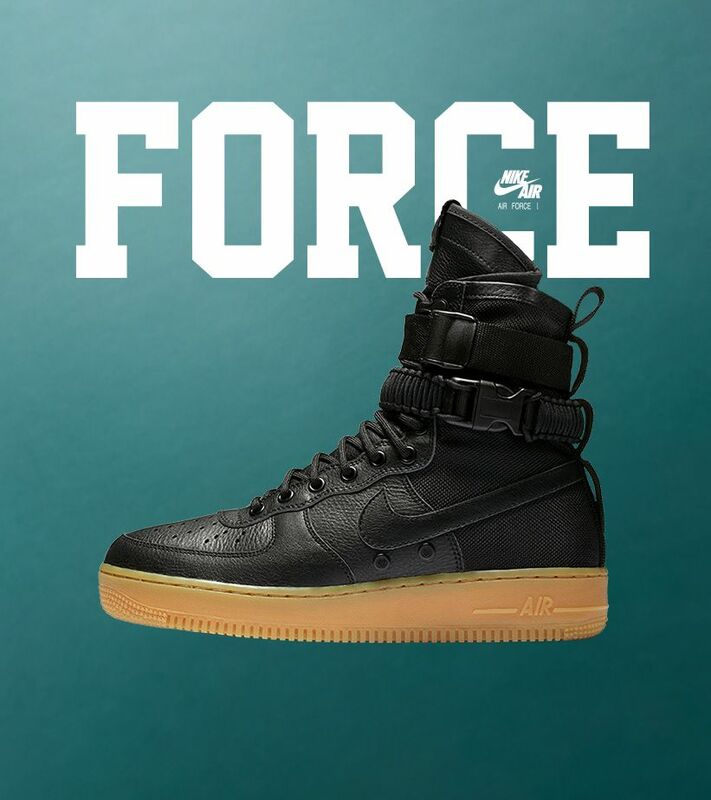 The Air Force 1's recognisable detailing is brought to life through thermo-moulding, which uses vacuum compression that renders the upper both durable and water-resistant. 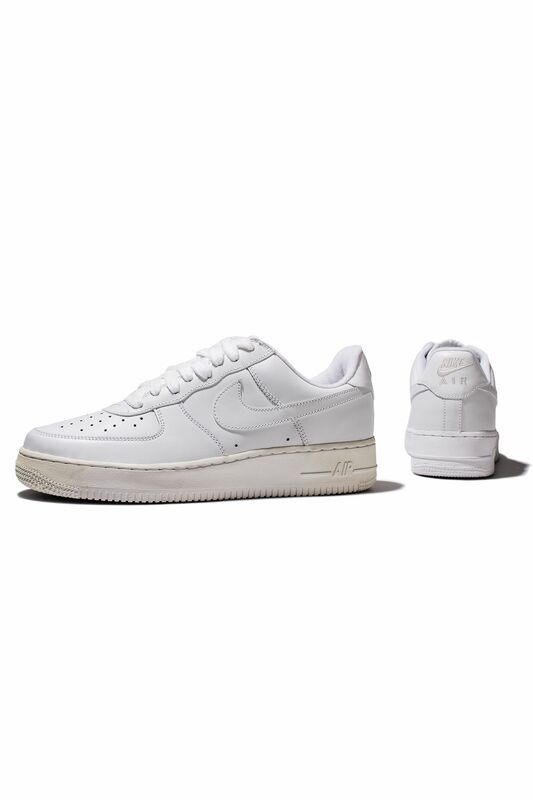 The Air Force 1 Low Downtown was first introduced in 2012 as part of the AF1's long-awaited 30th anniversary. 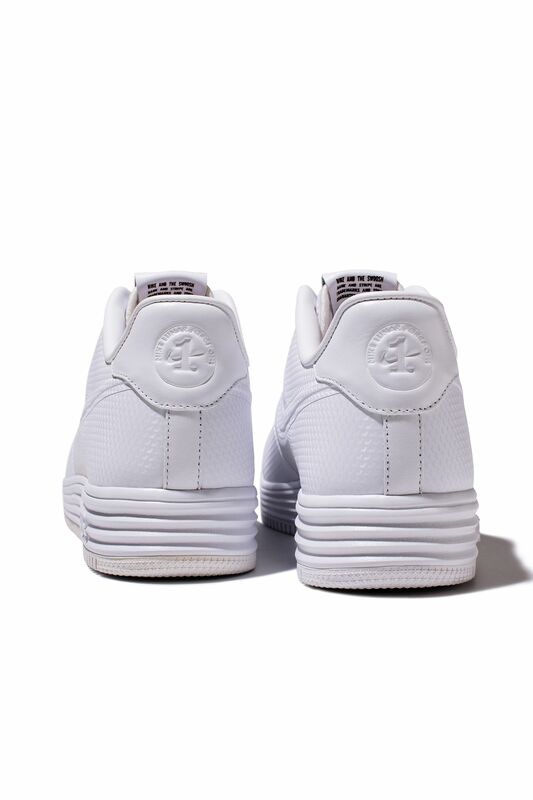 The design offered a lighter, slimmed-down take with a minimised rubber sole. 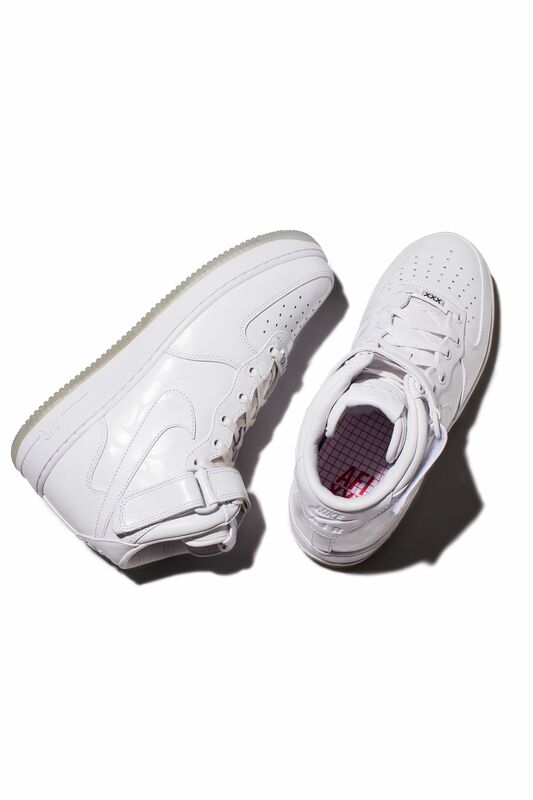 Easily one of the most rugged AF1s ever released, the White on White released in a modern, Foamposite construction in 2011. The shoe features a full Foamposite construction, moulded detailing and even a heel pull-tab. Down below, visible Air adds another touch of innovation. The Foamposite construction innovated the Air Force 1 like never before, thanks to its durable and adaptive properties. The 30th anniversary celebration also included a duckboot iteration of the timeless White on White. 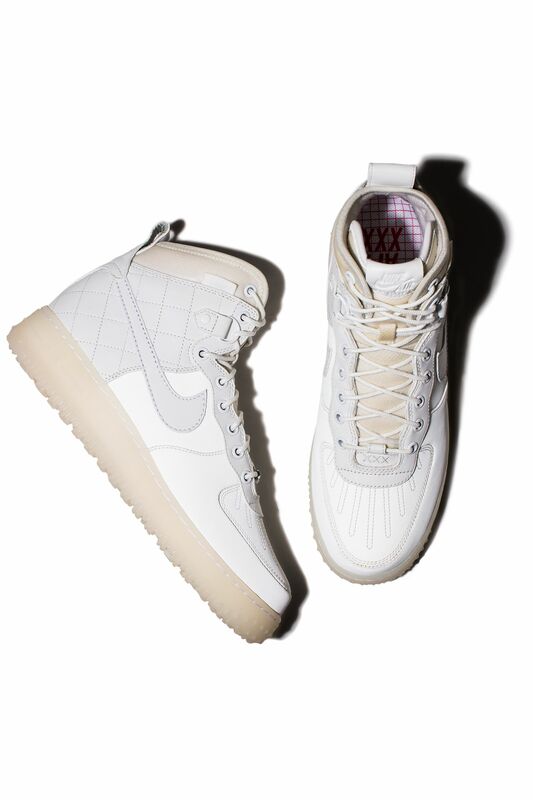 Just like other Air Force 1 Duckboot styles, the White on White was built for the winter season with a quilted leather upper, reinforced metal eyelets, a warming lining and an aggressive outsole pattern for improved traction. Seen as the most innovative take on the AF1 at the time, the 30th anniversary celebration was capped with the introduction of the Nike Lunar Force 1. 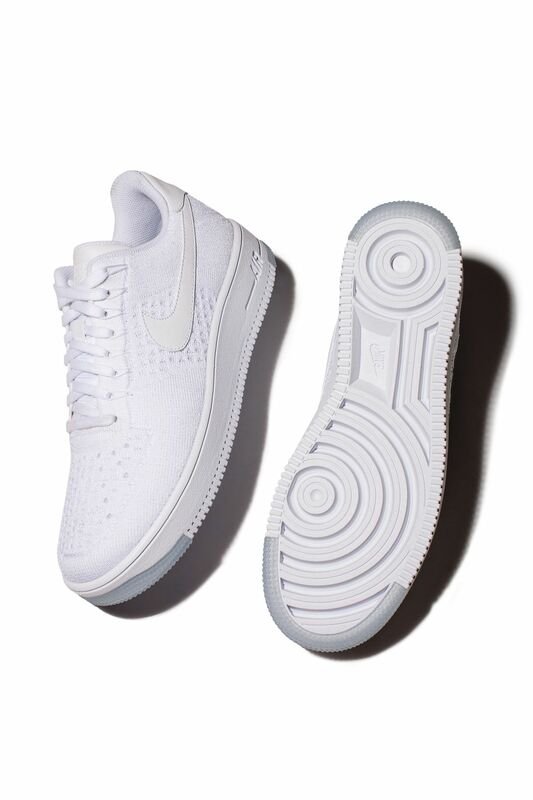 Lighter, far more breathable and cushioned, the Nike Lunar Force 1 presented the White on White in a full Hyperfuse construction sitting above a sleek, Nike Lunarlon-cushioned sole. The new Hyperfuse construction allowed for maximum breathability and durability, while the never-before-used Nike Lunarlon cushioning helped to create one of the most cushioned 1s ever. 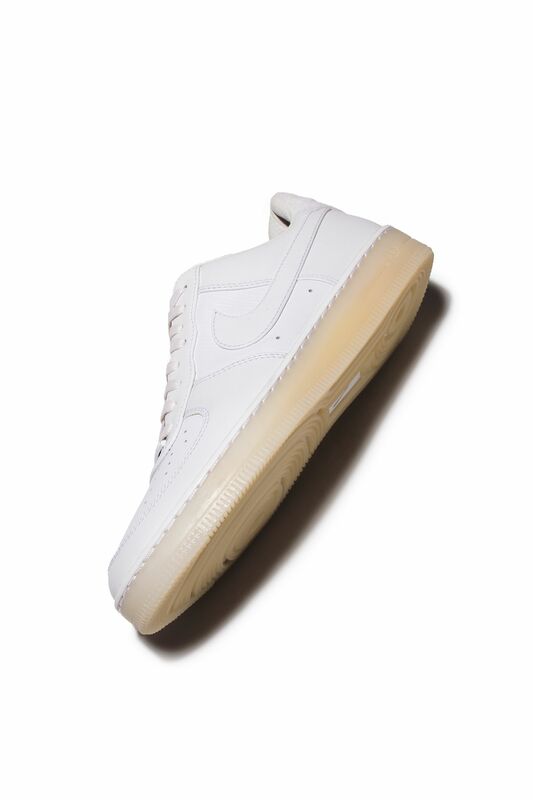 The 'CMFT' family of Air Force 1 presented one of the most unique modernisations of the silhouette. Built in a traditional fashion on the outside, the shoe features a hollow outsole that allows for a drop-in Phylon midsole to help lighten the shoe and improve overall comfort. The most recent iteration of the White on White boasts an impressive list of updates. Unveiled at the top of 2016, the iconic silhouette was remastered with a full Flyknit upper, sitting atop an incredibly light, Ultra sole. The White on White Flyknit iteration would go on to be released in both mid and low. 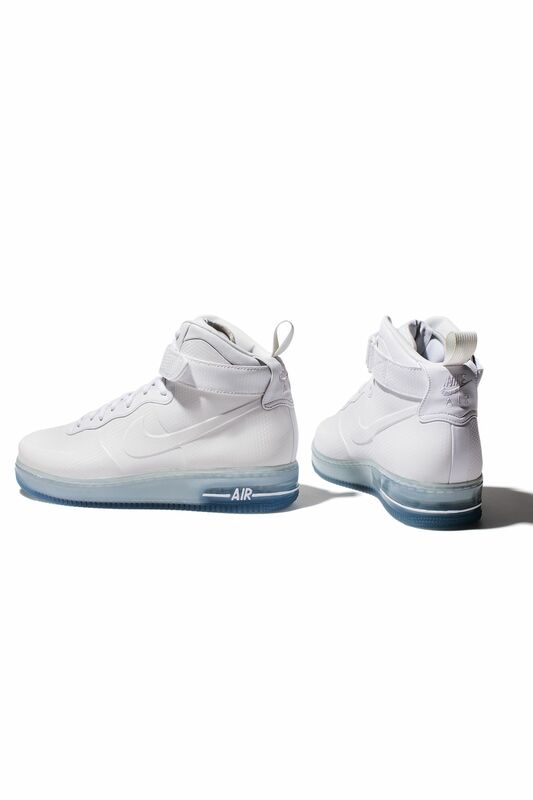 The SF AF1 represents the latest iterations of the White on White colour scheme. 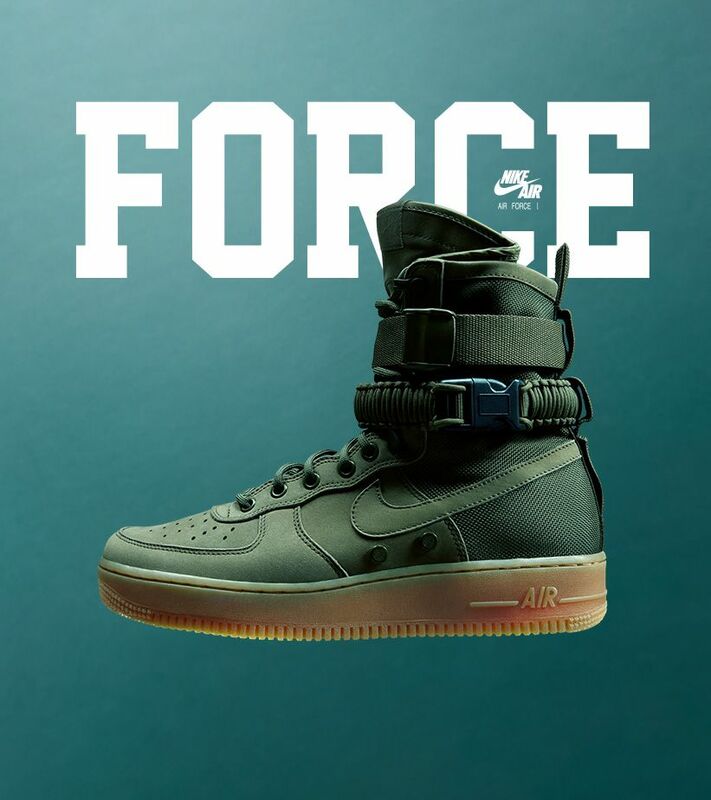 Equipped like never before, the SF AF1 comes to life with a premium leather construction, deconstructed heel and collar, all in a water-repellent finish. 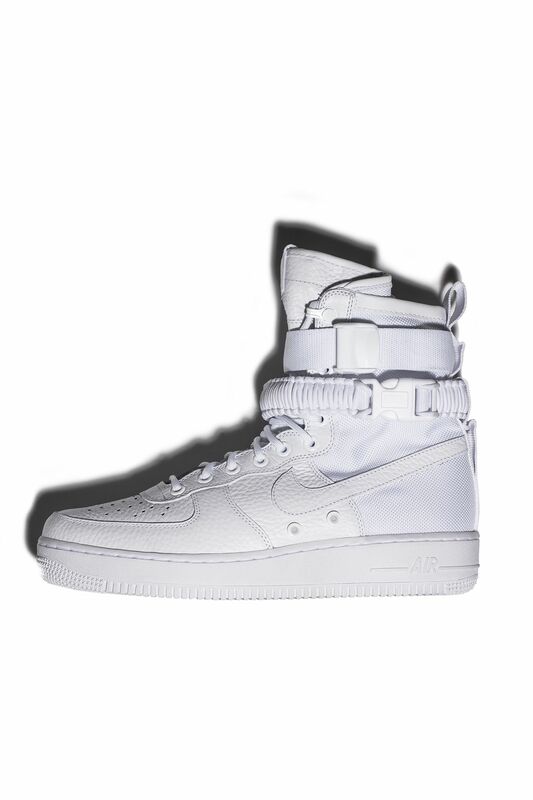 Bringing utility to the White on White family, the SF AF1 is equipped with an espionage pocket in the tongue and two removable collar straps.